In order to see a boost in revenue, Quick Service Restaurant (QSR) brands need to offer their customers relevant and personalized marketing materials in order to stand out from the crowd. And when Kahala Brands-owned Blimpie Restaurants wanted to increase guest frequency, drive additional drink purchases, and promote the trial of new menu offerings, they reached out to Mobivity to see how we could help. Over the following 12 week pilot program, Blimpie used Mobivity’s Recurrency platform to achieve just that. The trial resulted in both an attributable lift in customer frequency, and an increase in average customer visits. Blimpie’s pilot Recurrency implementation was 12 weeks long and was launched to a 70-location group of Kahala Brands-owned Restaurants. 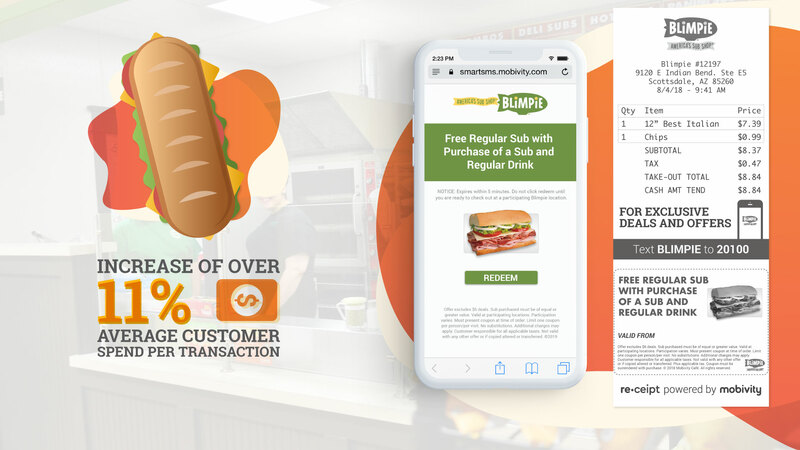 During that time, Blimpie utilized Mobivity’s Recurrency platform to capture basket-level POS data with Recapture, send personalized mobile offers to loyal customers with Reach, and print targeted in-store communications with Receipt. The goal of the Recurrency implementation was to increase customer frequency, spend, and loyalty through data-driven insights captured at the point-of-sale (POS) used to activate customers through Mobivity-owned channels. In the initial weeks of deployment, Blimpie locations utilizing Mobivity’s Recurrency platform saw a direct and attributable lift in customer frequency, and an increase of over 11% in average customer spend on transactions that included a Recurrency delivered offer.